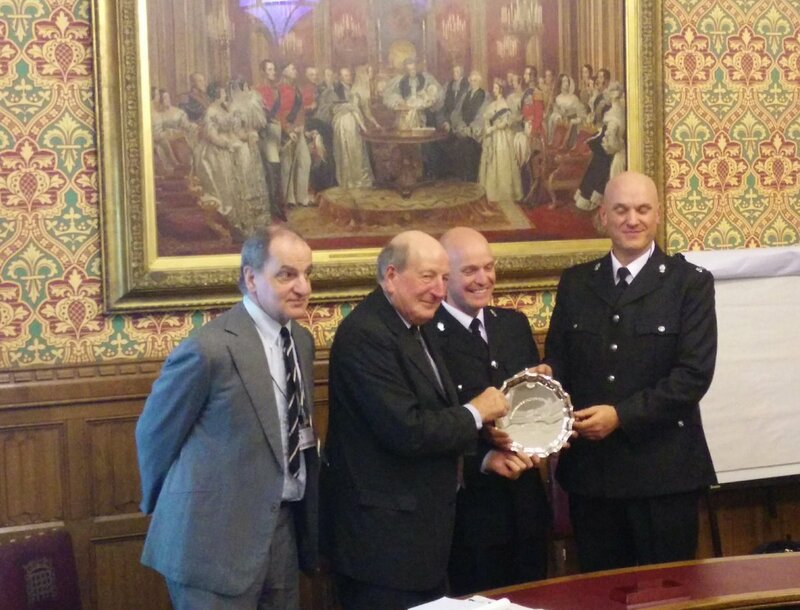 The RDRF has not given any awards before (apart from a virtual wooden spoon to West Sussex Gazette for the story “Wisborough Green tree collision; Emergency services were called to Wisborough Green after a collision involving a car and a tree on Tuesday January 31.” in 2012.) It had been suggested that we react more positively when encouraging news comes through. Of course, that doesn’t happen often, but we heard of GSBS, and it seemed to be positive enough. We are not going to be like the other award events where awards are given come what may: we hope that the rarity of this event will give it the added value that something as encouraging as this deserves. The evening was introduced by Baroness Jenny Jones. As a Member of the London Assembly she was behind the Mayor’s “London’s Lawless Roads” report as part of an initiative for more roads policing. 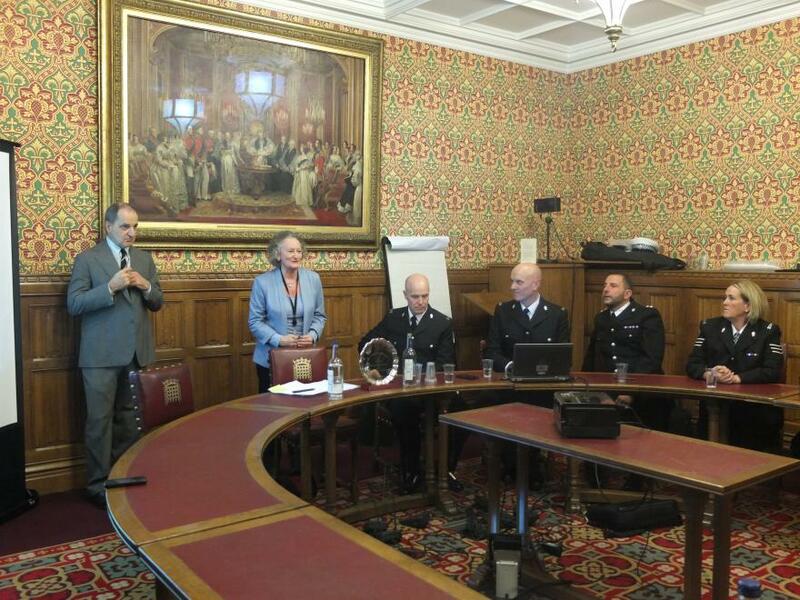 She commended the West Midlands police on their achievement, remarking that in 3 years in the House of Lords she had found it hard to achieve anything. She called for much more road traffic law enforcement to reduce danger. One crucial aspect of the conception of Operation Close Pass was careful consideration of evidence beforehand. WMP looked at the STATS19 data for the area and came to some interesting conclusions, which are summarised in a seminal blog post, “Junction Malfunction and a New Dawn” (a fascinating read — as Bez says, “it is something of a tectonic shift in aligning the police’s view with a number of points that most cycling and walking campaigners have been making for many years”). The basic point is that the evidence suggests that, in terms of public harm caused by cycling casualty collisions, little is due to environmental factors, little is due to the behaviour of people on bikes, and much is due to behaviour of people in cars. This is unsurprising when you consider the principle of road danger: the cause of it is not so much poor behaviour itself, but the combination of poor behaviour and a vehicle which allows that behaviour to pose great danger. It’s why we let children ride bikes but not drive cars. One reason is that it is something which can, unlike poor observation at junctions, be detected and proven relatively easily (using video evidence) and without waiting for a collision to have occurred. Another is that it cements in drivers’ minds the need to look for people on bikes, which may well improve observation at junctions. The fact that this is a covert operation is important: WMP understand that the risk of being caught is the most powerful aspect of traffic enforcement in terms of behaviour change, and key to that is the feeling that being caught could happen anywhere. But the third reason is perhaps the most interesting. If you ask anyone who cycles what they are most concerned about, the majority will say “close passes by drivers” (in the blog it is cited as “the most common complaint we receive from cyclists”). If you ask anyone who has given up cycling why they gave it up, many will say the same, as will many when asked why they never even started cycling. Certainly WMP seem to have found that to be the case, and this has influenced the prioritisation of the operation: a major part of the aim is to foster an environment in which more people feel able to cycle. PC Hodson’s explanation to Bez was that: the police should be involved in any situation where the general public feel unable to do certain things because of fear arising from the behaviour of others. To use a somewhat stereotyped analogy: if elderly people felt unable to walk to the local shops on their own because of groups of youths behaving threateningly, the police would apply the law to reduce the threatening behaviour and create an environment where people felt safe doing what they wanted to do. Tackling one group’s imposition of fear on others, inhibiting their ability to live their lives freely, is a community policing matter. The fact that it happens to involve the highway is really of no significance: it merely means a different piece of legislation is referred to when dealing with the threatening behaviour. The operation, which has been deployed nine times so far, involves an officer cycling in plain clothes on a bike equipped with both front- and rear-facing cameras. When they experience a close pass, two uniformed officers further up the road (one on foot, one on a motorcycle) are notified, and will pull the driver over and explain why they’ve been stopped. The explanation is not merely “a quick word”. It is a 15-minute demonstration of how and where people should cycle (i.e. well away from the kerb) and the dangers not just of close passes, but of passes at particularly problematic locations such as at pinch points, on pedestrian crossings and when approaching parked vehicles. In all, 130 drivers have so far been through this process, and WMP report that only one of those reacted negatively to it. (Note that the police frequently cite The Attitude Test: fail this and you’re suddenly rather more likely to be prosecuted than educated). The explanation involves a few props, central among which is a mat which shows a road layout with distances marked on it. WMP were keen to point out that these distances are illustrative only, and that the discussion is really about more humanly recognisable metrics: the width of a car door and the length of an outstretched arm are both used to illustrate the discussion. It’s worth noting that the officers unanimously saw the idea of a distance-based passing law as actively disadvantageous, on the basis that it actually provides more opportunity to undermine a prosecution. Much mention was made of the standards expected in the driving test: drivers are, for instance, required to leave sufficient clearance for a fully open car door when passing stationary vehicles. Driving that would fail the test is equated with failure to meet the standard that is “expected of a competent and careful driver”, as specified in the definition of careless driving. This is, essentially, the yardstick: would you pass your test driving like that? 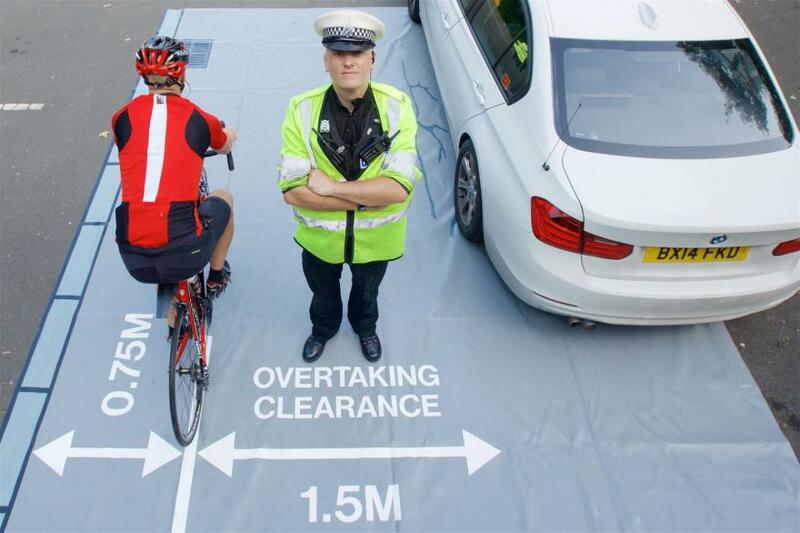 The officers didn’t believe that the UK would ever introduce a legal minimum clearance when passing cyclists, but said that nonetheless it’s easy to prosecute close passers under the careless or inconsiderate driving law 88. This is what’s used against tailgaters and middle lane hogs on the motorway, so the level of danger that has to be proven is fairly small. (If, however, you do want to consider the issue of what exactly is shown by footage, this article here might help). The operation has also brought numerous other offences to light, including several seatbelt violations and instances of mobile phone use, but also one of a driver who—even with his prescription glasses—could only read a number plate at 7.5 metres. This shows that the operational model is not excessively specific: it is a good way to catch a variety of dangerous behaviours. This can, of course, include people jumping red lights on bikes, or riding at night without lights. (Bez has discussed this here , and we have here and here ). 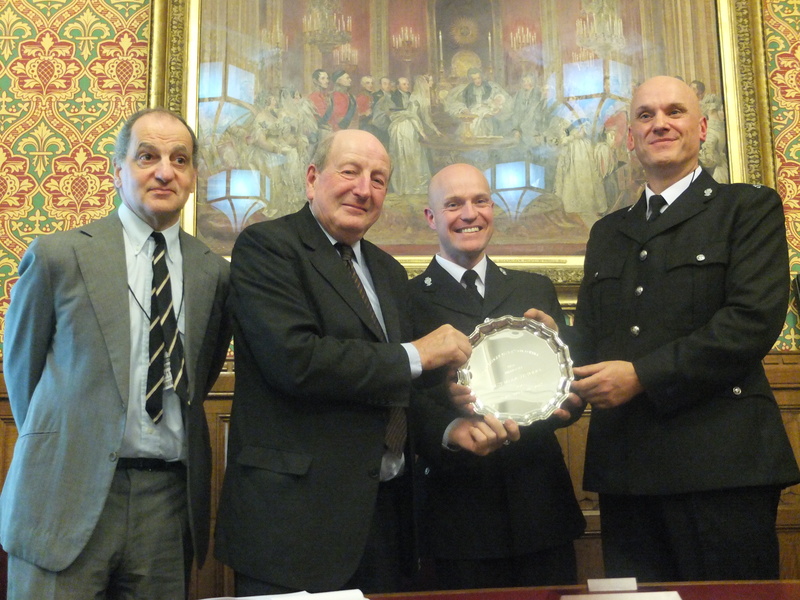 Dr. Robert Davis, Chair Road Danger Reduction Forum; Lord Berkeley, President RDRF; PC Mark Hodson; PC Stephen Hudson. One of the key operational features of the initiative is that it is cost-neutral. This is not to say that it is zero cost, but that it is simply a new area on which to focus existing resources: there is no additional spend on either materials or manpower, and no reduction in visible policing. The mat used for education was paid for by Birmingham Cycle Revolution. They also provide the lights given out by WMP to unlit cyclists; as part of Birmingham City Council’s programme to get 10% of all journeys made by pedal cycle by 2033. Not needing external funding gives officers more control. The question was raised from the audience that fines could fund the operation: however, the police officers here suggested that funding with fines results in claims that revenue-raising is the purpose of the operation. However, it’s possible to adapt BSGS to reduced levels of resourcing. The approach taken by Sgt Nick Clarke in Camden is an example of that: it uses no mat, and it is deployed on a relatively opportunistic basis, at times when other demands on the officers on the street are low. It also serves as a demonstration that whilst an understanding of cycling is important, there is no specific need for traffic police: in Camden the work is done as community policing.. He said his officers will use a “graduated response” and only use prosecution at first on the worst cases of bad driving, such as “punishment passes”. “We don’t just come in with a sledgehammer,” said Sgt Clarke, “so just like the start of the close pass stuff we initially didn’t do any reporting, we were just explaining why we are doing this stuff, saying: ‘you could kill someone’. He said the same process will apply for s59 reports – only the worst cases will be reported during the initial education phase. “When I hear the engine rev behind, and the person perhaps cuts me up I pull him or her over and they will be reported and will get a section 59 saying: if you do this again in your vehicle or anyone else’s, that vehicle will get crushed,” said Sgt Clarke. After the initial warning from officers, Clarke said video evidence from a third party would be sufficient to take a driver to court under section 59. Clarke has run the operation five times in the last month or so, with no additional budget. Clarke sends officers out on the roads for a couple of hours in the morning rush hour when most criminals aren’t operating. The Camden initiative involves a plain clothes officer on a bike, and several others at key points around a figure of eight loop. Officers target mobile phone driving as well as those who pass too close to the cyclist. Clarke says writing up evidence for driving misdemeanours also provides good training for newer officers. As said in my introduction to the evening, the RDRF’s aim is not just to give an award, but to generate good practice and get good examples taken up elsewhere. We’re pleased that a number of police services have shown interest to WMP. But why is only one London Borough MPS service acting at the moment? Sergeant Simon Castle, from the Met’s Cycle Safety Team (officers on bicycles), said they had trialled the scheme, but with slow traffic speeds in London cyclists were overtaking traffic, rather than the other way round. It would be necessary for his superiors to allow an operation in outer London where there are faster motor vehicles speeds and more unpleasantness with close overtaking, but fewer cyclists KSIs. This is the critical point for the road danger reduction movement – the absence of “sufficient” cyclist KSIs may mean there is no problem for officials using traditional “road safety” guidelines. For us, there are often fewer KSIs precisely because there is more danger or intimidation from motor traffic, so people are less likely to cycle in the first place. Even if there are other reasons for low amounts of cycling, the fact remains that there is a problem of road danger from close overtaking (and perhaps excessive speed) which needs to be tackled. Sergeant Clarke, who runs his operation on Parkway in inner London, feels it is replicable by other ward sergeants, and that it can have wide-reaching effects on driver behaviour across London. The key points made by all the questioners in the audience were praise for both the initiatives described, and requests for similar types of police operation to occur elsewhere. Martin Porter, solicitor, explained why his private prosecution of a driver who endangered him failed: he went for a more serious offence, requiring better evidence of incompetence, and convincing a jury. The defence was able to say that the offence couldn’t be that serious, as the police never bothered with it. Adam Coffman of the All-Party Parliamentary Cycling Group asked the WMP how they felt about the Road Safety Minister’s recent comment that “Road safety is about people taking responsibility for themselves”. I’m pleased that the WMP officer responding took the road danger reduction line in saying that he disagreed with him. Road danger reduction takes what we think is the basically civilised view that your responsibility is to reduce your danger towards others. But not all was optimism. Amy Aeron-Thomas of Roadpeace said that we should comment on the London Police and Crime Review, a mayoral consultation document that contains little or nothing about traffic law enforcement. As Brenda Puech of RDRF added, London police have to follow the mayor’s policing priorities, so this document is important. This is not about any kind of patronising initiative “for cyclists”. It is the implementation of road danger reduction – reducing danger at source from inappropriate driving. It is done through policing and education as part of achieving necessary cultural and behavioural shift. It was started by an individual police service, and is being taken up by others and road danger reduction campaigners (none of the “road safety” establishment seem to have shown any interest). So where do we go from here? It’s quite likely that we will run a follow-up conference in a few months’ time – possibly to coincide with alerting London government to the need for a policing strategy which takes in to account the sort of anti-social behaviour targeted by WMP and Camden MPS. In the meantime do feel free to contact RDRF with any queries and information to help start a similar programme in your area. Great report. It was a really inspiring evening. Interesting point about a safe passing distance and the law. On countries that have laws specifying a legal minimum, I wonder how many successful prosecutions there are, if any. I would expect that in France the number would be exactly zero unless there was an actual collision. Your expectation is probably correct. Here in Tennessee, USA, we have had a 3ft safe passing law, complete with advertizing campaigns, for about 10 years. Several State attorneys have refused to prosecute using the law because they say there is no evidence that a driver passed closer than 3ft unless it is witnessed by a police officer. In case you thought that was a bad attitude, I can also tell you that in at least one case where the cyclist was struck, (so there is incontrovertible evidence that the vehicle came closer than 3ft) there was even discussion as to whether or not to include the 3ft law in the list of charges, “because the cyclist might have been swerving erratically, so the car driver couldn’t be expected to maintain 3ft!” AND in case you thought THAT was a bad attitude, prosecutors have also stated they will not use the 3ft law for head-on or side-on collisions, because the wording of the law “is only for vehicles passing (overtaking) cyclists, not any other maneuver”! So doubting the benefits of a law actually stating a distance is justified, I’m afraid. Pingback: What kind of policing do we need?